The Puja Prasadam comprises of several Spiritual elements, all of which are energized during the Puja and sent to our clients so that they can get maximum benefits & satisfaction from the Puja that has been performed especially for them by our Guruji and his team of Brahmins. A Beautiful Chunri which can be settled on your Puja Altar or on the idols of Deity or Yantras. 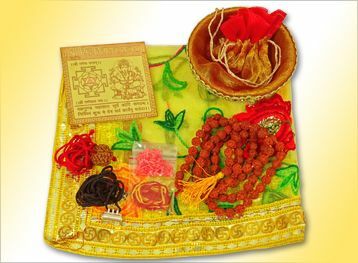 Kumkum (sacred vermilion) and Akshat (Rice) sent in small self locking bag to be applied on forehead after you have received the Prasadam. Energized Red Thread (Mouli) sent in small self locking bag which has to be tied on the Right Hand wrist for Males and on the Left Hand wrist for Females. Please note that this Mouli is very Auspicious and hence it can be tied on the hands of rest of your family members as well. This Mouli builds a Protective and Auspicious Aura wherever it is tied. An Energized Rudraksha Mala which may be worn by you or optionally the same can be kept on your Puja Altar. A Yantra which has been energized during the Puja along with Mouli tied around it. You may follow the provided instructions regarding this Yantra (a few yantras can be kept at home while the others may have to be disposed as instructed) depending upon the type of Puja. An Energized 5 Mukhi Rudraksha bead which may be worn by you or alternately kept on the Puja altar / Cash Box. We do not send any edible items for consumption since the same can get spoiled while in transit and thereby becoming unsuitable for consumption.